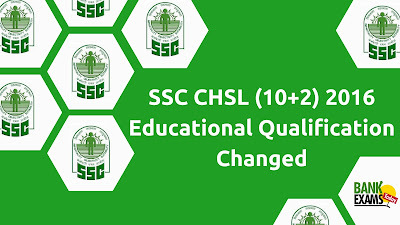 Candidates who have applied for CHSL Examination, 2016 may please refer to the Corrigendum uploaded on the website of the Commission on 05.04.2017 under the ‘Latest News’ and ‘Notice’ title, intimating the candidates regarding revision of Educational qualifications for the post of Data Entry Operator, in the Office of the Comptroller and Auditor General of India (C&AG), mentioned in Para 8 of notice and parameters for Skill Test for Data Entry Operator given in Para 12.2 of the notice of Combined Higher Secondary Level(10+2) Examination,2016 published on 08.10.2016. Educational Qualification: 12th standard pass in Science stream with Mathematics as a subject form a recognized Board or equivalent. Skill Test: A speed test of not less than 15000 key depressions per hour for data entry work to be ascertained through speed test on computer.